The Crown of Queen Alexandra was the consort crown of Alexandra of Denmark, the queen consort of King Edward VII. It was manufactured for the 1902 coronation. Queen Victoria's death in January 1901 ended 64 years of the United Kingdom lacking a crowned queen consort, and Prince Albert of Saxe-Coburg and Gotha had not been crowned as a consort. Traditionally, queens consort had been crowned with the 17th century Crown of Mary of Modena. However, in 1831, Adelaide of Saxe-Meiningen, consort of King William IV of the United Kingdom, was crowned with a 4 half-arched new small crown, the Crown of Queen Adelaide, because the Modena crown was judged too poor in quality, too old and too theatrical. In 1902 it was decided to use neither the Modena nor Adelaide crowns for the first coronation of a queen consort in seven decades. Instead it was decided to create a brand new consort crown, to be named after Queen Alexandra. The crown departed from the standard style of British crowns, and was more akin to European royal crowns. It was less upright than the norm in British crowns, and more squat in design, with an unprecedented eight half-arches. Its front arch joined a jewelled cross into which was set the Koh-i-Noor diamond. As with the later Crown of Queen Mary and Crown of Queen Elizabeth, the arches were detachable, allowing the crown to be worn as a circlet. The Crown of Queen Alexandra was not worn by later queens; new crowns were created for Mary of Teck in 1911 and Elizabeth Bowes-Lyon in 1937. The major stones have been replaced with artificial stones referred to as paste. 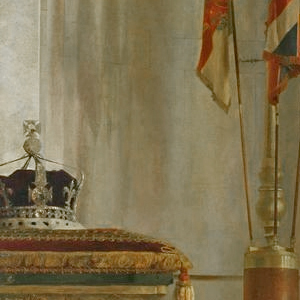 In the United Kingdom, the Accession Council is a ceremonial body which assembles in St James's Palace upon the death of a monarch, to formally proclaim the accession of the successor to the throne. Under the terms of the Act of Settlement 1701, a new monarch succeeds automatically. The proclamation merely confirms by name the identity of the heir who has succeeded. 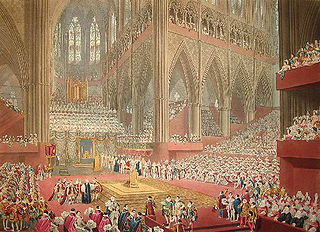 The coronation of the British monarch is a ceremony in which the monarch of the United Kingdom is formally invested with regalia and crowned at Westminster Abbey. It corresponds to the coronations that formerly took place in other European monarchies, all of which have abandoned coronations in favour of inauguration or enthronement ceremonies. The George IV State Diadem, officially the Diamond Diadem, is a crown that was made in 1820 for King George IV. The diadem is worn by queens and queens consort in procession to coronations and State Openings of Parliament. It has been featured in paintings and on stamps and currency. It can be seen in the Queen's Gallery at Buckingham Palace. The Crown of Queen Adelaide was the consort crown of the British queen Adelaide of Saxe-Meiningen, wife of King William IV. It was used at Adelaide's coronation in 1831. It was emptied of its jewels soon afterwards, and has never been worn since. The Small Diamond Crown of Queen Victoria is a miniature imperial and state crown made at the request of Queen Victoria in 1870 to wear over her widow's cap following the death of her husband, Prince Albert. It was perhaps the crown most associated with the queen and is one of the Crown Jewels on public display in the Jewel House at the Tower of London. 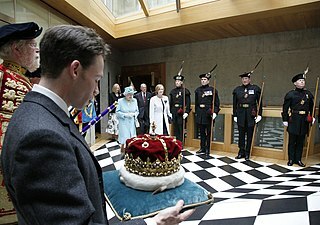 The Crown of Scotland is the crown that was used at the coronation of the monarchs of Scotland. Remade in its current form for King James V of Scotland in 1540, the crown is part of the Honours of Scotland, the oldest surviving set of Crown jewels in the United Kingdom. The crown dates from at least 1503 when, in an earlier form, it was depicted in the portrait of James IV of Scotland in the Book of Hours commissioned for his marriage to Margaret Tudor. There have been 12 monarchs of the Kingdom of Great Britain and the United Kingdom since the merger of the Kingdom of England and the Kingdom of Scotland on 1 May 1707. England and Scotland had been in personal union under the House of Stuart since 24 March 1603. A royal consort is the spouse of a ruling king or queen. Consorts of monarchs in the United Kingdom and its predecessors have no constitutional status or power but many had significant influence over their spouse. Some royal consorts, such as current consort Prince Philip, Duke of Edinburgh, have also helped to enhance the image of the Monarchy by becoming celebrities in their own right. Prince Philip is the longest-serving and oldest-ever consort. His mother-in-law, Queen Elizabeth The Queen Mother, who died aged 101, lived longer but at the time of her death she did not hold the position of consort, as her husband King George VI died 50 years before her. The Tudor Crown, also known as the King's Crown or Imperial Crown, is a widely used symbol in heraldry of the United Kingdom. Officially it was used from 1902 to 1953 representing not only the British monarch personally, but also "the Crown", meaning the sovereign source of governmental authority. As such, it appeared on numerous official emblems in the United Kingdom, British Empire and Commonwealth. The coronation of George V and Mary of Teck as King and Queen of the United Kingdom and the British Empire took place at Westminster Abbey, London, on 22 June 1911. This was second of four such events held during the 20th century and the last to be attended by royal representatives of the great continental European empires.